The campaign for the September 18 Shiromani Gurdwara Parbandhak Committee (SGPC) poll came to an end today. Chandigarh: The Chief Commissioner, Gurdwara Election Commission, HS Brar, has directed that the voters of SGPC election should establish their identity at the polling stations at the time of poll on September 18 by producing the identity cards issued to them under the authority of Election Commission of India. Bibi Jagir Kaur, the first women president of the SGPC, has been espousing the cause of gender equality in performing ‘seva’ in gurdwaras, but with little success. Several houses in Chief Minister’s Badal village have voters with identical names. 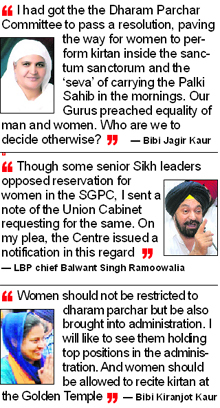 The SGPC voters’ list reads that Raja Ram Singh (vote no. 709), Raja Ram Singh (vote no 713) and Raja Singh (vote no 720) are three members of a family living in one house. Two days before the SGPC elections, the Punjab and Haryana High Court today directed the Punjab Chief Secretary, the Director-General of Police and the Chief Commissioner of Gurdwara Elections to ensure that the poll was “conducted in a fair and free manner”. Farmers in large numbers blocked the Patiala-Kaithal highway for almost two hours today. They burnt the effigies of the Centre and the Punjab and Haryana Governments at the Punjab-Haryana border, 45 km from Patiala in protest against the construction of the 3.75-km toe wall along the Hansi-Butana canal by Haryana. Punjab Pradesh Congress Committee president Capt Amarinder Singh today asked Chief Minister Parkash Singh Badal to reduce the “back breaking” taxes on petrol in the state if he was really concerned about the common man. The mortal remains of the SAD legislator Jatinder Singh Kariha, who died of cardiac arrest on Wednesday, was consigned to the flames at his native village Kariha today. Transport Minister Surjeet Kumar Jyani today said that there would be no hike in bus fares in the state. Punjab had, however, formulated a uniform policy for charging passengers travelling on buses plying on toll tax routes. Come October and the connectivity of Sri Guru Ramdas International Airport, Amritsar, with Europe will get a major boost with the introduction of a new all-economy direct flight from Vienna to Amritsar. Discussions are on at the government-level regarding the long-pending demand of keeping some quota for the doctors working in the rural areas under Zila Parishads since June 2006 in the postgraduate (MD/MS) courses in the government medical colleges of Punjab. Senior functionaries in the Department of Health and Family Welfare, Punjab, have confirmed that state government is considering the demand of Rural Medical Officers (RMOs) for keeping a quota for them in the PG courses. Bhisiana (Bathinda), September 16 As part of the 60th anniversary celebrations (diamond jubilee) of the Golden Arrows, the gallant 17 Squadron of the Indian Air Force (IAF), an impressive programme was organised at the Air Force Station here today. The Commodore Commandant of the squadron, Air Vice-Marshal BS Dhanoa, was the chief guest on the occasion. In order to equip government school girls with various self-defence techniques, a project has been initiated in Patiala district under which the girl students of 100 schools would be taught martial arts, judo-karate and taekwando. The Industrial Training Employees Union, Punjab, has demanded an independent inquiry into alleged irregularities in the office of the Joint Director of the Industrial Training Department. The Punjab and Haryana High Court has restrained Baba Farid University of Health Sciences and at least 20 nursing institutes from admitting students in excess of the seats recognised by the Punjab Nurses Registration Council. The Punjab and Haryana High Court has restrained the State of Punjab from carrying out fresh appointment of wards of the Punjab Police personnel against two per cent reservation made for them. The campaign for the September 18 Shiromani Gurdwara Parbandhak Committee (SGPC) poll came to an end today. The poll, which has been overdue since 2009, will see nearly 52 lakh Keshdhari Sikhs vote for electing 170 members to the 190-strong general house of the SGPC, considered as "mini parliament" of the Sikhs. Justice (Retd) HS Brar, Chief Commissioner of Gurdwara Election Commission, said all preparations had been completed and final arrangements were being made. The Punjab Government has assured the commission that the Punjab Police will be able to handle the law and order situation and that central security forces would not be required. The Commission has ordered to regulate the sale of liquor till the completion of the poll on Sunday. An official said security personnel would be deployed at both sensitive and normal booths in a phased manner from tomorrow. Unlike in the past, there are nearly half a dozen candidates, including Sekhwan, Jagir Kaur, Tota Singh and Avtar Singh Makkar, who would later be in the race for the president's post. In all, a little over 52 lakh voters will exercise their franchise. This time only Keshdharis, who have given an undertaking that they follow the tenets of Sikhism, have been included in the voters list. 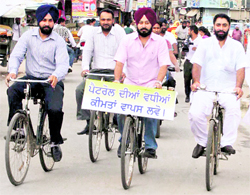 During the last SGPC election in 2004, even the Sehajdharis (clean shaven) Sikhs were allowed to vote. Both Chief Minister Parkash Singh Badal and Deputy Chief Minister Sukhbir Singh Badal campaigned aggressively for their party candidates and the candidates of Sant Samaj with whom the SAD has formed an alliance, which came as a surprise for many. Meanwhile, the Delhi Sikh Gurdwara Management Committee (DSGMC) has shown keen interest in the poll with its representatives actively taking part in the campaigning helping those opposed to the SAD-Sant Samaj alliance. As part of their promises to the voters, Makkar has said that the next General House will work at establishing a Sikh museum at a cost of Rs 100 crore at Akali Market Sri Amritsar and Rs 25 crore would be spent on the construction of sarai (inn) at Saragarhi site. He has also announced that the upgradation of the langar building at Sri Harmandar Sahib would be completed by the next SGPC house at a cost of Rs 20 crore. 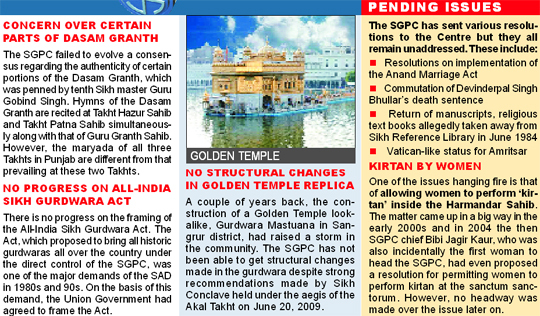 The run-up to the SGPC elections has been quite uncertain. At one point, it was thought that the poll would have to be postponed when the counsel for the Government of India, Harbhagwan Singh, made a statement in the High Court that a notification debarring Sehajdhari Sikhs from voting had been withdrawn. Union Home Minister P Chidambaram and Union Law Minister Salman Khursheed had to make statements in Parliament saying the statement was wrong and polls would be held on time. Over the past months, there have also been several complaints of registration of false or ineligible voters. According to one report, some non-Keshdharis and Muslims have also figured in the voters list in Chief Minister Parkash Singh Badal's village allegedly at SAD's insistence. Kanwarpal Singh, Dal Khalsa spokesperson, has sent a complaint in this connection to the Gurdwara Election Commission Chief Commissioner. The Dal Khalsa has demanded that the Union Ministry of Home Affairs and various deputy commissioners should ensure that those who have got registered as voters due to political interference and those who were patently bogus voters were debarred from polling booths. Meanwhile, the Chief Gurdwara Election Commission has issued fresh directions to the governments of Punjab, Haryana and Himachal Pradesh and Chandigarh Administration and through them to the authorities working under them responsible to take suitable measure to create and preserve an atmosphere conductive to the holding of fare free and peaceful election. In case of request by some parties and individuals, the Chief Gurdwara Elections Commission may allow videography of the events on the request by the candidate and on his own expenses. For this purpose, a candidate who wants to make use of video camera will get permission from the returning officer or the deputy commissioner concerned. Until 1966, The Sikh Gurdwara Act, 1925, was a state Act but after the reorganisation of Punjab into Punjab, Haryana, Himachal Pradesh and Chandigarh, the Act became a Central Act under the Union Government. In all, the SGPC has 190 members but elections are to be held for 170 seats. Of the remaining 20 seats, 15 members are elected by co-option and the remaining are the five head priests of the five sacred Sikh Takhts. Of the 170 seats where elections are being held, 157 are in Punjab, 11 in Haryana and one each in Himachal Pradesh and Chandigarh. Of these, 30 seats are reserved for women and 20 for Scheduled Caste candidates. Though the SGPC polls are witnessing a triangular contest between the ruling SAD, the Panthic Morcha and the SAD (Amritsar), the SAD is attacking only the Morcha during the campaign. Also, the SAD has virtually turned the contest from SAD versus Morcha to SAD versus Congress by continuously dubbing the Morcha leaders as the “agents of the Congress”. The SAD is directly attacking the Congress for “interfering in the religious affairs of the Sikhs and trying to gain control over the SGPC through the Morcha”. So much so that SAD president Sukhbir Badal has been lashing out at PPCC chief Capt Amarinder Singh and not the Morcha leaders in his SGPC poll rallies. The party also reminds the voters about the alleged Congress role in Operation Bluestar and 1984 anti-Sikh riots. The SAD candidates are also trying to cash in on the work done by the SGPC in the fields of propagation of religion, education and healthcare, including opening of various schools, colleges and Guru Granth Sahib World University. Incidentally, they are also not shying away from blowing the trumpet of the SAD-led Punjab government’s feats, listing out developmental works carried out by their regime in the last four and a half years. 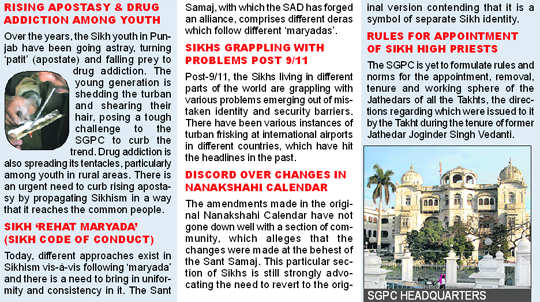 The Panthic Morcha has been targeting the SAD on the alleged mismanagement and corrupt practices in the SGPC. They are accusing the SAD of misappropriating funds, received in the form of offerings in major gurdwaras, as also the property belonging to various shrines. The Morcha is also raising the issues of rising apostasy and drug addiction among Sikh youth while charging the SAD with not doing enough to propagate the religion and curb these evils. The alleged distortion of Sikh history in various publications is another issue, which has been raised by the Morcha to attack the SAD in the poll arena. Where such an identity card had not been issued or is not available for whatsoever reason, the voters can establish their identity by producing any of the documents, including driving licences, PAN card, bank/post office passbooks, ration card, arms licence, SC/ST/OBC certificate issued by competent authority, pension documents such as ex-servicemen's book/pension payment order and old age pension order widow pension order. Bibi Jagir Kaur, the first women president of the SGPC, has been espousing the cause of gender equality in performing ‘seva’ in gurdwaras, but with little success. “I had got the the Dharam Parchar Committee to pass a resolution, paving the way for women to perform kirtan inside the sanctum sanctorum and the ‘seva’ of carrying the Palki Sahib in the mornings. Our Gurus preached equality of man and women. Who are we to decide otherwise? Bibib Jagir Kaur pointed out that during the time of Guru Hargobind, all spiritual and temporal issues were successful dealt with by Mata Ganga. The names of SGPC voters in another house are Jagdish Ram, son of Chuhar Ram Singh (vote no. 671), Jagdish Singh son of Chuhar Singh (vote no. 673), Amandeep Singh, son of Chuhar Singh (vote no 674) and Amandeep Singh, son of Chuhar Ram Singh (vote no 675). In this house live two more SGPC voters-Bhana Devi Kaur, wife of Chuhar Ram Singh, and Bhana Devi, wife of Chuhar Singh. The voter list has many more such voters in the village. Muktsar Deputy Commissioner Arashdeep Singh Thind said it was being verified if these voters were genuine. Badal village is part of the Gidderbaha SGPC seat where Gurpal Singh Gora, sitting SGPC member of the SAD(B) is the candidate. Before Manpreet Badal was ousted from the SAD(B), Gora was known as his confidant. Hence, there are high stakes on this seat. The total number of SGPC voters in Badal village are 1,720. Justice Permod Kohli and Justice Ritu Bahri also directed them to ensure there was no “intimidation” of voters. “It is further directed that adequate police force be deputed at all the polling booths, particularly the sensitive stations, for maintaining law and order, with the sole objective of holding free and fair elections”. Videography outside the polling booths at the expense of the candidates, too, was allowed and the Superintendent of Police asked to provide security to the candidates after assessing the threat perception. The directions came on a bunch of three petitions by Inderjit Singh, Gurbaksh Singh and Sukhjit Singh. In their petitions filed against the Union of India through senior advocate ML Saggar, the petitioners had sought directions for deployment of Central Reserve Police Force (CRPF). Directions were also sought to appoint observers and prevent the casting of bogus votes. Security and permission for carrying out videography were also sought. As the case came up for hearing, Central Government counsel Ajay Kaushik accepted the notice after seeking instructions from Assistant Solicitor-General Anmol Rattan Sidhu. The Bench observed: “It is not possible to interfere in the election process at this belated stage. Free and fair elections to any democratic organisation or institution is the hallmark of a democratic polity. Thus, to ensure free and fair elections and for maintaining law and order, certain directions at this stage are necessary. Before parting with the order, the Bench asserted: “The petitioners are at liberty to arrange for videography outside the polling stations... It is, however, made clear that videography shall not be conducted inside the polling booth so as to maintain the secrecy of the polling”. Farmers in large numbers blocked the Patiala-Kaithal highway for almost two hours today. They burnt the effigies of the Centre and the Punjab and Haryana Governments at the Punjab-Haryana border, 45 km from Patiala in protest against the construction of the 3.75-km toe wall along the Hansi-Butana canal by Haryana. The residents of flood-prone areas gathered at Dharmheri village in the morning. Addressing the farmers, state president of the BKU Ekta (Dakunda) Buta Singh Burjgill accused CM Parkash Singh Badal and Haryana Chief Minister Bhupinder Singh Hooda of playing politics on the issue. "In reality, neither Punjab nor Haryana is concerned about the plight of the poor people who have to endure floods year after year", he said. The protestors handed over a memorandum to Patiala district officials as well as Haryana government officers. "The construction of the wall should be stopped immediately and a siphon should be made at the stretch of the canal that was breached during the floods last year", demanded the coordinator of the Anti Hansi-Butana Canal Committee, Dr Darshan Pal. The protesting farmers said instead of wasting funds on the construction of the wall, the authorities should think of providing a proper drainage system. "The inhabitants of the flood-prone villages should be given a special monetary package", demanded Rajinder Singh Grewal of Hassanpur village. Dr Darshan told mediapersons that they would stage a protest outside the office of the Patiala Deputy Commissioner on October 4 if the government continued to be indifferent to their demands. He said petrol in Punjab was costliest in the country because of extra taxes. Capt Amarinder Singh alleged that Badal had no moral right to oppose the hike in petroleum prices as his government had imposed exorbitant taxes on petrol in the state making it costliest in the country. “Badal must be feeling happy in the heart of his hearts as any hike in petrol price is going to generate extra revenues with proportionate increase in the taxes collected on the sale of petrol,” Amarinder remarked. Suggesting that in case the government really felt concerned about the common man it could reduce the VAT on petrol, he said Punjab under the Akali-BJP regime imposed a total of 32.75 per cent taxes on petrol. “No other state has imposed so much tax on petrol…. Punjab charges 27.5 per cent VAT, 10 per cent surcharge on VAT, Re 1 per litre infrastructure development cess and 1.5 per cent octroi. In stark contrast, Haryana has 20.5 per cent, Himachal Pradesh 24 per cent and Chandigarh 22 per cent taxes,” he said. The former Chief Minister said the petroleum prices were determined by the prices in the international market and the Indian companies were already suffering an annual loss of about Rs 1.2 lakh crores on account of subsidy. Amarinder said if the states wanted they could provide relief to the people by reducing the taxes as he had done during his tenure as the Chief Minister when he had provided tax relief on petrol to balance the hike in the prices. Leader of the Opposition in the assembly Rajinder Kaur Bhattal, in a separate statement, also asked the Chief Minister to reduce state taxes on petrol to lessen the burden of the petrol price hike on consumers. She said the petrol prices in the state were among the highest in the country. It would now cost Rs 74.50 per litre in Punjab whereas in Haryana it would cost Rs 67.14 a litre, she added. Chief Minister Parkash Singh Badal, Dr Daljit Singh Cheema, Harcharan Bains, media adviser of the CM, former Lok Sabha Deputy Speaker Charanjit Singh Atwal, former ministers Master Mohan Lal, Chaudhary Swarna Ram, Jathedar Tota Singh and Jathedar Kuldip Singh Wadala were among those who attended the funeral. Mohalla Shamshan Bhoomi in the morning. Thousands of people had queued up at the Old Grain Market, Nehru Gate, Chandigarh Chowk and Ambedkar Chowk to pay floral tributes to the departed soul. Some of them accompanied the funeral procession. Kariha's pyre was lit by his grandson Harman Sandhu amid enchanting of prayers by Sant Baba Labh Singh of Quila Anandgarh Sahib and Jathedar Tarlochan Singh of Takht Sri Keshgarh Sahib, Anandpur Sahib. The bhog and antim ardas will take place on September 24. The Chief Minister said Kariha would be remembered as a “gentleman-politician”. He said the death was a great setback to the SAD. Jyani said the said user charges were already being recovered by state transport undertakings and private operators, but the charges levied were separate for every case. Thus, to bring uniformity and to avoid multiplicity, the new policy had been formulated. With this policy the fare tables (according to which the fare is charged by the bus operator) would be revised once and for all. The possibility of a marginal increase in the charges between two destinations on toll roads could not be ruled out. Moreover, the passengers travelling in the flight will get an incentive of flying to Takht Sri Hazur Sahib, Nanded, from Amritsar totally free of cost. Addressing mediapersons here today, Amritsar MP Navjot Singh Sidhu said, “The Union Civil Aviation Ministry has given permission to Comtel Air for commencing flight operations from Vienna (Austria) to Amritsar from the first week of October. This non-stop flight would facilitate the passengers to reach Europe in approximately 6 hours.” which is half as compared to the other airlines.” The move would facilitate NRIs in 25 European destinations from where Vienna is easily approachable. The air fare on this all-economy flight would be anywhere between Rs 25,000 to Rs 30,000. The flight also has the permission to take the outbound passengers. According to Sidhu, the talks are on with three private airlines --- Jet Airways, Kingfisher and Spice --- for connectivity between Amritsar and Takht Sri Hazur Sahib and this too will start by the end of October. The Vienna-Amritsar flight will be four times a week, while that to Nanded would be twice a week, which will be gradually increased to five times a week. “This decision will also connect Amritsar with Mumbai, which was one of the most sought after links in Punjab, something that is evident from the fact that there are six flights to Mumbai from Chandigarh,” he said. The British Midland International, popularly known as BMI, has already announced that it will be connecting the holy city to London from October 14. The tri-weekly flight will be the only direct air service available from Punjab to Britain. The travel time from Amritsar to London will be 12 hours and from London to Amritsar 11 hours 35 minutes, with a brief stop-over in Almaty, Kazhakastan, but without changing the aircraft. At present, 60 per cent seats in the PG (MD/MS) courses are reserved for the Punjab Civil Medical Service (PCMS) doctors. Rest of the seats are filled through direct recruitment. The RMOs have been demanding that there should be some fixed quota for them in the PG courses. "We had recently met senior functionaries of the Department of Health and Family Welfare and it has been conveyed to us that our demand is under consideration", claimed state president of Rural Medical Services Association (RMSA) Punjab Dr Aslam Parvez. "We are hopeful that the RMOs, whose services were regularised by the state government in March this year, would also be given the benefit of quota", said Dr Parvez. Organising secretary of the RMSA, Dr Anand Malhotra, said the Department of Rural Development and Panchayats, which controls the functioning of the Zila Parishads, had already agreed to their demand and recommended the reservation of RMOs in PG(MD/MS) courses way back in October 2007. "Because of the low salaries, job insecurity and non-availability of the reservation in PG courses, already about 600 doctors had left the job of RMO and had taken jobs at other places. There is a dearth of physicians, specialists, especially gynaecologists, orthopaedics, paediatricians, radiologists and experts in medicine, in the public sector. When contacted, Principal Secretary, Health, Punjab, Satish Chandra said so far nothing had been finalised. He, however, confirmed that deliberations were on at the Chief Secretary level regarding the demand of the RMOs. "Three government departments are involved in the matter. Hence, the government would take a decision after having elaborate discussions with functionaries of all the departments concerned", he added. As part of the 60th anniversary celebrations (diamond jubilee) of the Golden Arrows, the gallant 17 Squadron of the Indian Air Force (IAF), an impressive programme was organised at the Air Force Station here today. The Commodore Commandant of the squadron, Air Vice-Marshal BS Dhanoa, was the chief guest on the occasion. Displaying their skills, an 11-member Air Devil team, led by Squadron Leader Dinesh Tyagi, jumped from a height of 8,000 ft from an aircraft with parachutes. A member of the team jumped with the Air Force flag while three others demonstrated their skill by making the Tricolour formation with coloured parachutes. After this demonstration, an 18-member Air Warrior Drill Team presented a wonderful performance by making various formations, including tunnel. An Air Force officer also presented an aircraft aero modelling show by flying a model aeroplane with remote. Later, Air Vice-Marshal Dhanoa and the Commanding Officer of the Air Station, Wing Commander Rajesh Nandedkar laid wreaths at the war memorial. Air Vice-Marshal also inaugurated the Station Museum. Interacting with mediapersons, Air Vice-Marshal Dhanoa said the 17 Squadron was formed on October 1, 1951, at Ambala. He said the 60th anniversary celebrations were on and would conclude on October 1 at Delhi. He said the 17 Squadron participated almost in all the wars, including those in 1965 and 1971, besides playing a key role in “Operation Safed Sagar” during the Kargil war in 1999 and won the highest number of gallantry awards in the IAF, including a Vir Chakra (posthumous) to Squadron Leader Ajay Ahuja. Besides the officers of the Air Station, their family members were also present to witness the show. District Education Officer (Elementary) Balbir Kaur Gill would be the overall in charge of this project which has been initiated under the Sarv Shiksha Abhiyan. Giving information in this regard, DEO Gill informed that this project was aimed at providing basic martial arts training to girl students so that they could defend themselves at the time of need. “We time and again hear about various unpleasant incidents involving women and these camps would certainly help them in fighting against odd situations,” she added. She further informed that this training would be arranged for 30 working days. Each school would be given Rs 5,000 to implement this scheme, out of which the trainer would be paid Rs 100 per day. Remaining amount of Rs 2,000 would be spent on the students, she added. Talking to The Tribune, Taekwando coach Satwinder Singh informed that he had already started training girls in 16 schools of Patiala city with the help of Surinderpal Singh, Abhinav Sharma, Neeraj Pathak, Mohit Mittal, Mohit and Ram Kumar. Sources in the department informed that as many as 50 schools would be covered under Girl education scheme and 50 under SC/ST education. He further informed that the department had also sought a grant for organising educational trips for government school students which would be released by the end of this month. The demand was raised at a meeting with Punjab Technical Education Minister Surjit Kumar Jayani by a union delegation, comprising its adviser Iqbal Singh and state president Sunil Sharma. The delegation demanded that only an independent inquiry could bring out the truth regarding irregularities worth several crores of rupees. A Division Bench also warned the varsity and the institutes of appropriate action, if they violated the High Court directions. The order came on a petition filed by a human rights protection group “Ehsaas”. In its petition placed before the Division Bench of Acting Chief Justice M.M. Kumar and Justice Gurdev Singh, the organisation had alleged that the respondents in order to extract money issued roll number to 218 students against 20 permitted seats just a day before the commencement of the examinations. The petitioner had also sought the High Court’s intervention for issuing directions to the State of Punjab and other respondents to strictly adhere to the procedure and the guidelines specified vide a notification issued by the State of Punjab for the allocation of seats to private nursing colleges and institutes for admission to auxiliary nursing and midwifery course. Elaborating, the petitioner asserted that the institutes were charging between Rs 1.5 lakh and Rs 2.5 lakh for the course. This was much more than the fee prescribed by the government. They added that a fraud was being played with the students and the general public by providing untrained nurses to the people. Taking up the petition filed through counsel K.S. Dadwal, the Bench asserted: “The respondents and other institutes shall not admit any student over and above the approved/recognised seats by the Punjab Nurses Registration Council. “It is made clear that if any of the respondents and the institutions indicated in the order resort to admission of extra candidate, it will be regarded as a violation of the directions of this Court and suitable action in accordance with law shall be initiated against them”. Before parting with the directions, the Bench also fixed October 12 as the next date of hearing in the case. The State has also been directed to explain the reasons and the logic behind making such reservation for the wards of Punjab Police personnel. This order by Justice Surya Kant came on a petition filed by Ranjit Singh. In his petition, Ranjit Singh had thrown a challenge to the state government’s action of not giving him appointment against the seats reserved for police personnel. Going into the background of the controversy, he had contended that in 1996, the Punjab Government had issued instructions, whereby two posts were reserved in the direct recruitment for the wards of Punjab Police personnel and a number of appointments were made under this reservation policy. Justice Surya Kant asked the State counsel to explain the object and reasons behind making such reservation. The Bench observed that such a reservation in the direct recruitment clearly affected the fundamental rights of the citizens.